36 of our finest vintage Christmas images from the picture postcard's golden era. 36 of our finest vintage Christmas images from the picture postcard's golden era. During the great era of postcard publishing (which dated from the 1890's until World War I) a great many different designs for postcards were produced. 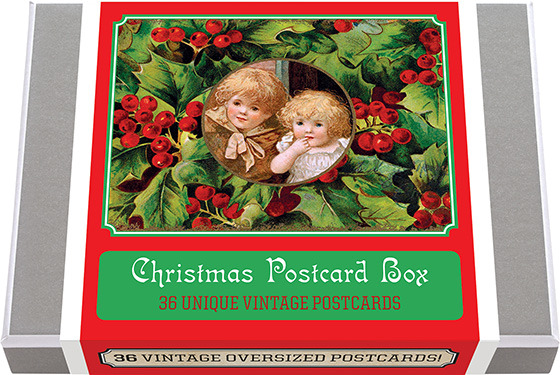 Holidays were a favorite time to send postcards, and as Christmas has always been the number one card sending occasion, Christmas themed cards abounded. The imagery of these cards is varied, appealing, and dramatic. Our selections use the familiar imagery of Christmas - Santa, Reindeer, Christmas Trees, and more. What better way to send a short Marry Christmas note than with a postcard! We have selected for this collection 36 unique images and added a vintage postcard back with dividing line and stamp box. Made in America with high quality paper and packaged in a deluxe, keepsake box.